One exciting late note about the Music and More camp beginning August 20: the final performance will be at the Shalin Liu Performing Center on Friday, August 24 at 11:15 am. What an exciting chance for the kids to sing (and you to hear) in this great space. 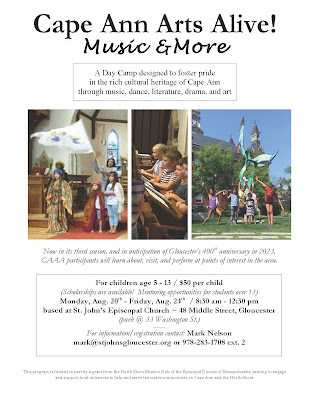 Cape Ann Arts Alive - Music & More Day Camp! At St. John’s Episcopal Church, 48 Middle Street, Gloucester, MA. 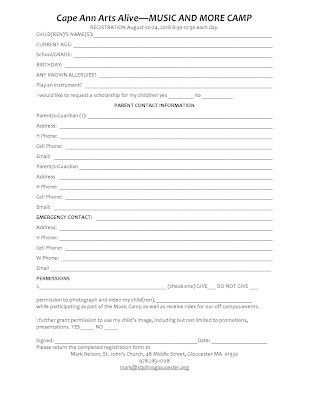 Registration is now open and ongoing for CAPE ANN ARTS ALIVE - MUSIC AND MORE, a week-long day camp for children aged 5 - 13. Fostering knowledge and pride in the unique character of Cape Ann, the camp runs from August 20 - 24 (M - F), 8:30 AM - 12:30 PM. 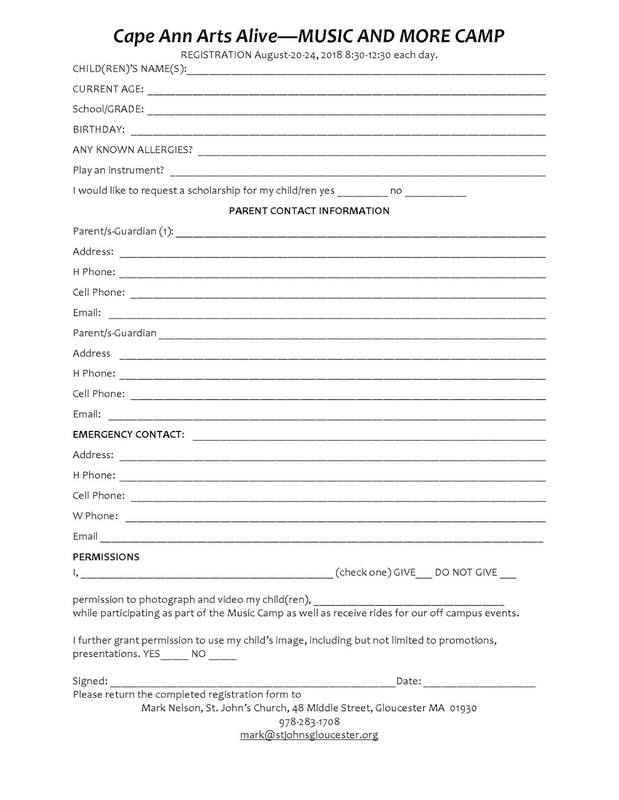 Based at St. John’s Episcopal Church at 48 Middle Street in Gloucester, the camp, now in its third year and open to children from all traditions, is sponsored a civic outreach project for Cape Ann sponsored by the North Shore Mission Hub and supported by the Episcopal Diocese of Massachusetts. Daily visits to nearby local points of interest provide campers with experience and performance opportunities. Each year’s campers have built a foundation of singing, bell ringing, art, drama, and movement to create a repertoire in anticipation of Gloucester’s 400th Anniversary celebrations. Works related to Cape Ann’s rich cultural heritage (songs of Stephen Scotti and Leonard Bernstein, dances like “The Lobster Quadrille” from Alice in Wonderland, and artworks such as nautical pennants and papier mâché fish) provide a wide range of artistic endeavor, and productive, joyful activity. This action-packed week ends at the renowned Shalin Liu Performance Center in Rockport on Friday, August 24 with a brief, free concert at 11:15 AM. All are welcome! 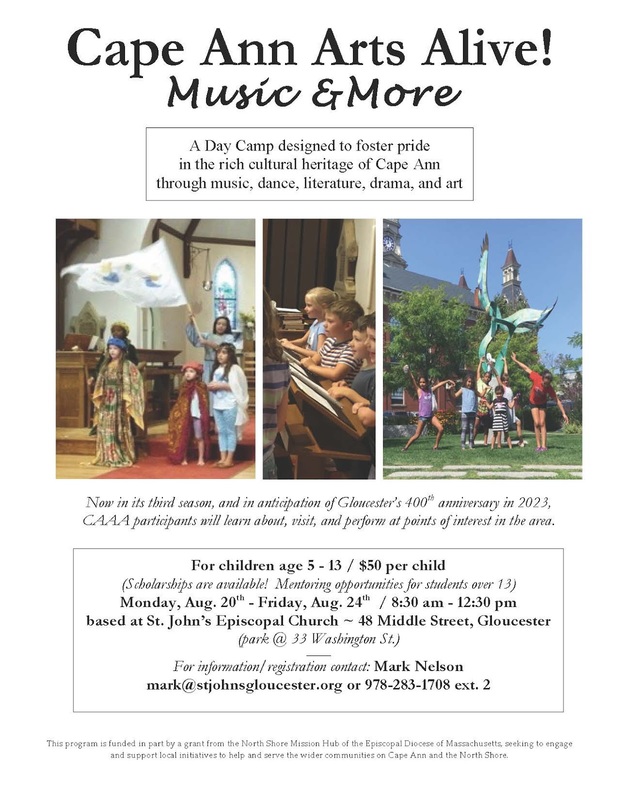 The camp is staffed by local musicians known for their successful work with children’s programs: Kathleen Adams (Annisquam Village Church), Eva DiLascio (St. Paul Lutheran), Kristina Martin (1st Congregational, Rockport), and Mark Nelson (St. John's Episcopal). Registration is $50. More details are available at stjohnsgloucester.org/musicandmore or by contacting Mark Nelson mark@stjohnsgloucester.org or 978-283-1708. Scholarships are available. Contact Mark Nelson 978-283-1708, ext 2, or email mark@stjohnsgloucester.org. Scholarships are available. Contact Mark Nelson.